While these incidents are not common, tragic consequences of self-inflicted neck injury due to neck trauma are periodically reported. Research shows that most people who suffer from self-inflicted neck trauma did not know of the potential dangers. Therefore, awareness of these problems can help prevent them. Young people, in particular, are at risk of accidental or deliberate self-inflicted neck injuries from actions such as attempted suicide and choking games. Several types of activities that cause neck pressure may induce injuries to the arteries in the neck or to the spine. Consequences of this type of neck trauma can include stroke, brain damage, spine damage or death. Most people have never heard of the complications of attempted suicide. Brain damage and stroke are among the most serious, life-altering consequences of attempted suicide. The neck pressure that results from attempted strangulation can cause ischemia (lack of blood supply) of the brain due to physical compression of the carotid arteries or the vertebral arteries. This type of external injury to the carotid arteries and the vertebral arteries can produce a combination of long-term consequences, such as weakness, difficulty speaking, vision loss, coordination problems, memory impairment, behavioral changes and inability to walk. A sudden injury to the blood vessels requires urgent intervention, which may include extensive surgical procedures. Even after surgical repair of the blood vessels of the neck, some survivors suffer from permanent brain damage or brain death. Some young people, as well as adults, have been reported to take part in solitary or group activities involving 'hanging' that is intended to be temporary. Such activities involve decreasing oxygen to the brain and may be intended to induce a type of enjoyment for the participants. Oxygen deprivation can occur very quickly due to pressure on the neck, causing rapid brain damage. The resulting physical weakness, confusion or delirium may make it impossible for participants to consciously reverse the neck pressure, ultimately resulting in death or permanent brain injury. In some instances, it is difficult to determine whether deaths were accidental or intentional. There are occasional reports of children, teens, and young adults who have been injured or who have died while taking part in ill-defined choking 'challenges' or games while either alone or in a group. Recreational choking games or rituals can result in trauma to the carotid arteries and vertebral arteries and may result in oxygen deprivation to the brain. This may cause immediate death or may cause severe brain damage. In some instances, emergency surgery may be attempted in order to repair the injured blood vessels. However, even if the blood vessels are repaired, residual brain damage is likely. When blood flow to the brain is interrupted, the brain lacks vital oxygen and nutrients, which causes brain cells to lose function. The Carotid Arteries in the Neck: Blood supply to the brain is carried through two large blood vessels called carotid arteries. The carotid arteries run on the side of the neck, one on the left side and one on the right side. 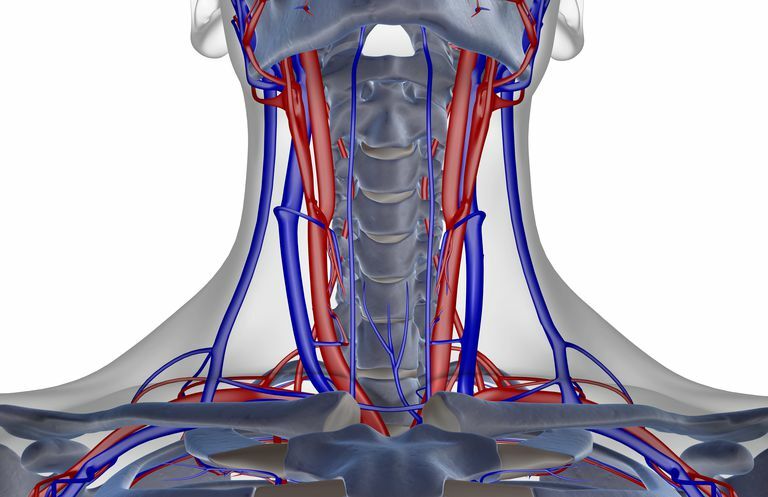 Blood from the carotid arteries carries oxygen and nutrients to the frontal lobes, parietal lobes, and temporal lobes. The Vertebral Arteries: The vertebral arteries are located in the back of the neck and they provide blood to posterior (back) regions of the brain. The vertebral arteries primarily supply blood to the brain stem, the cerebellum, and the occipital lobe. Neck injuries due to self-injury are relatively uncommon but may be life-threatening. It is important to be aware of the dangers of placing physical pressure on the neck and to avoid deliberate neck pressure for any reason. Studies show that between 3-5% of youth report participation in choking games or similar activities. Additionally, young children and even young adults are often not aware that some of these behaviors can be harmful. Therefore, it is beneficial for adults such as parents, teachers, and healthcare professionals to identify youth who may be at risk or who may be participating in such activities and to intervene whenever these actions are suspected or identified. The choking game: a risky behavior for youth, Mechling B, Ahern NR, McGuinness TM, J Psychosoc Nurs Ment Health Serv. 2013 Dec;51(12):15-20. doi: 10.3928/02793695-20131029-01. Epub 2013 Nov 7. What Happens If You Have a Parietal Lobe Stroke?